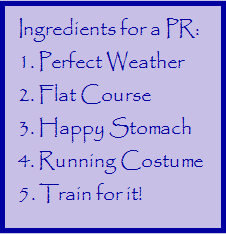 Since #4 is equally important as the others, Aimee & I started brainstorming costumes the day we registered. 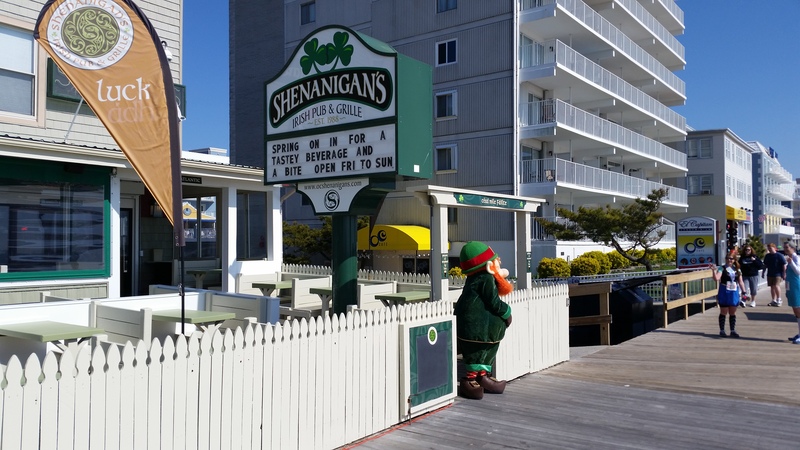 We thought of maybe something to do with the ocean…… crabs? surfers? tourists? salt water taffy? 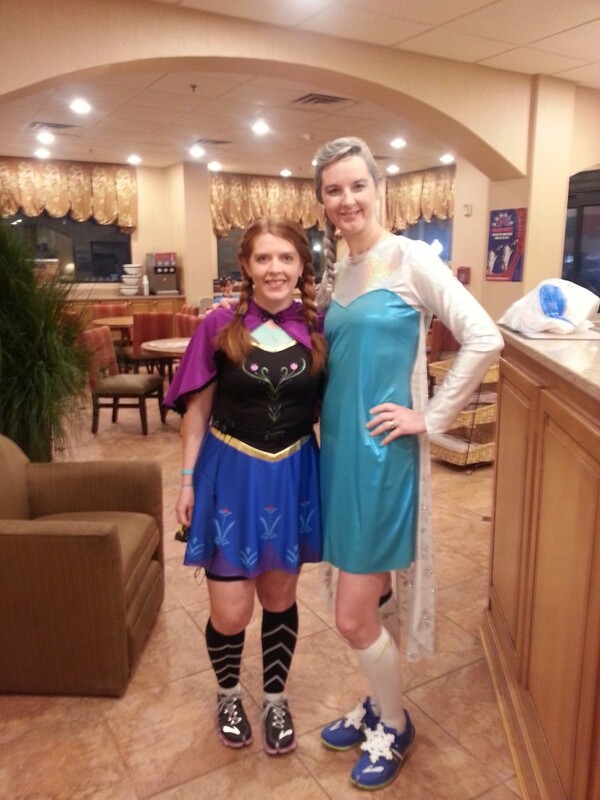 But I had just received the Frozen DVD from my Dad and was OBSESSED with it, so I insisted we be Anna & Elsa. Aimee was on board so I got busy sewing right away. 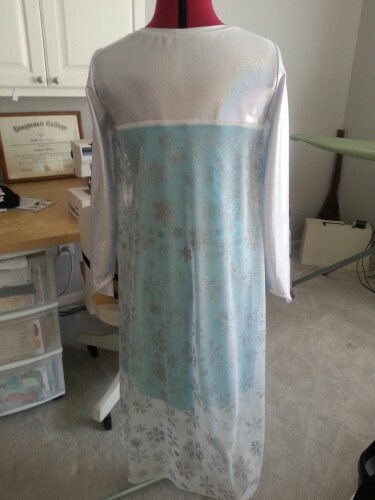 I had some turquoise sparkly fabric in my stash that would be perfect for Elsa and I had enough scraps from other costumes for Anna, so I was able to make them both for pretty cheap. The only things I had to buy were the fabric for Elsa’s sleeves & cape, some fabric paint, and the green shirt to go under Anna’s vest, which I found at Target. Since a pattern didn’t exist for Elsa yet, I had to make my own. I based it on McCalls 6559 again since that fits Aimee pretty well, but had to draft the whole top part myself. For the cape, I used some mesh fabric from Joann’s performance fabric section. I got some silver metallic fabric paint and a snowflake stencil from Hobby Lobby and started painting. The paint was too light on its own so I put some fine silver glitter on the wet paint as I stenciled. Well that method didn’t work very well because the glitter would not stick, so I had to spray it with silver glitter fabric spray to try to seal it on there. That did the trick. I love how it turned out and Aimee seemed pretty pleased with it too. To make her dark brown hair look blonde, we used Jerome Russell’s white and platinum blonde spray and I think it did a nice job transforming her into the Queen. For Anna, I reused Simplicity 2757 (from Aimee’s hook costume), Supplex fabric and a LOT of fabric paint. I made my own stencils from blank stencil sheets from Michael’s and a sponge brush to paint on Tulip’s Soft fabric paint to mimic all of the embroidery on her dress. I was going to paint some plain black compression sleeves I bought off of Groupon as well, but they took FOREVER to arrive, so I had to settle for these Meister ones from Amazon at the last minute. Close enough! The cape is from Simplicity 2546 and made with purple spandex and some black pom-pom trim. I lost it during the race, but it took about 30 minutes to make so I can whip up another one if I need to. It annoyed the heck out of me anyway, so I’m not that sad about it. The race used to start in Ocean City and you had to run 13.1 miles to Assateague Island, and then they would bus you back to the start. They finally figured out this year (the 10th anniversary of the race) that they should go the other direction. I never ran it the old way, but I do think this way makes more sense. The old way must have made for a non-exciting finish with hardly any spectators and Assateague is pretty small with very few facilities. Busing the runners to Assateague at the start made it possible for everyone in Ocean City to cheer for us at the finish line and we didn’t have to wait for a bus to take us back to the after party. That being said, they still have a few kinks to work out. There either weren’t enough buses or they were taking half empty buses to the start. The race instructions said there would be NO buses after 6:15 AM for the 7 AM race. We got in line at 5:50 and made it to Assateague with about 15 minutes to spare for the 7 AM start. Unfortunately, it didn’t start at 7. Or at 7:15. After dropping us off on an island with about 5 porta potties and ZERO trash cans, the race finally started at 7:30. We were not impressed. We needed to be in Alexandria by 1 or 1:30 to see Aimee’s son play in his first ever tee-ball game, so we were on a tight schedule. But that just meant we had to run faster (and drive faster) to make it in time! The other thing we didn’t like was the way the road closures were handled. We had to run on the shoulder of a busy road for the majority of the race and Aimee LITERALLY got hit by a car at one point. She was OK, but some of the residents were not very welcoming to the runners at all. We started out a little fast (for me) and I had to stop and walk around mile 6. That felt amazing, so we decided to walk at every mile marker from then on. But we were able to hold a nice, quick pace despite the walking and came in like a boss at 2:14:30. 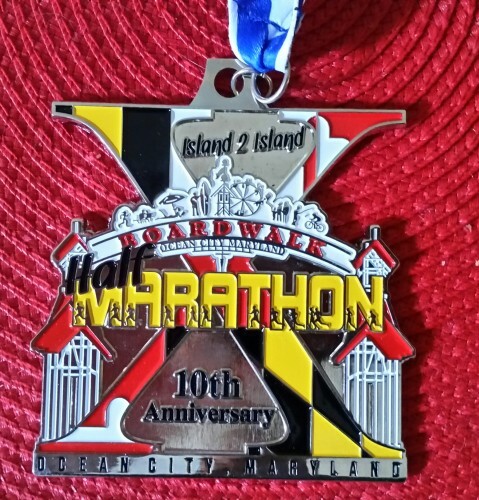 The last mile was almost entirely on the boardwalk, which was lined with bikers and tourists (my hubby qualified as both) cheering us on to the finish. 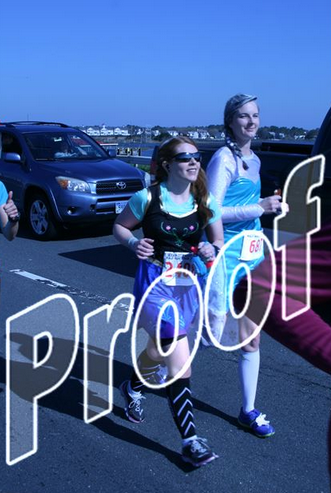 But Aimee and I had fans along the entire course because of our costumes. Some cheered, some screamed, and some were rendered completely speechless, but every little girl in Ocean City got a little wide-eyed when they saw us. Loved it! After those shenanigans, we hightailed it to DC to make it to the tee-ball game. Since the race started so late, we didn’t have time to shower, so we showed up to the game still in our costumes. They didn’t know quite what to make of us there, but hopefully they saw our righteous medals and figured it out. The bottom line: this is a great race to try for a PR. The weather is usually nice and there are only two hills on the bridges going over the water. Hopefully they will continue to work on their organizational skills and get the logistics worked out a little better next time. I think this is my favorite costume so far. My kids loved them and they really looked cute! 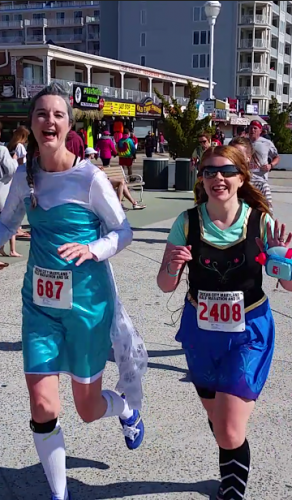 So many people on the course were belting out “Let It Go”! Too much fun! 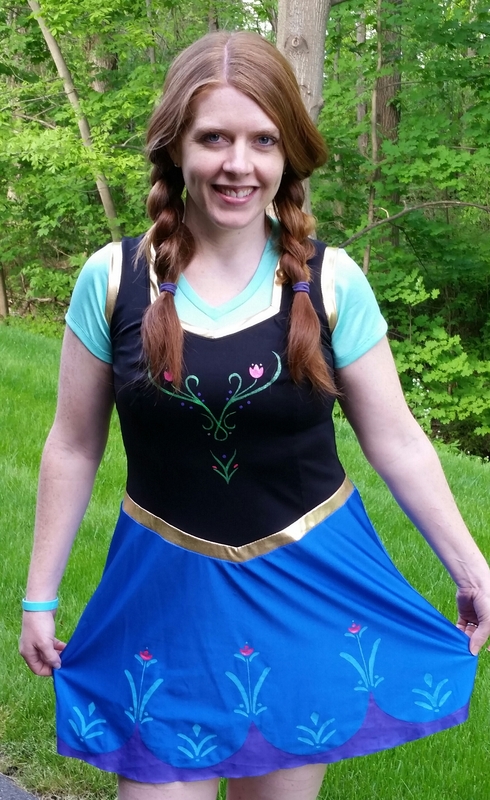 Awesome job on the race, sewing and the blog!!! 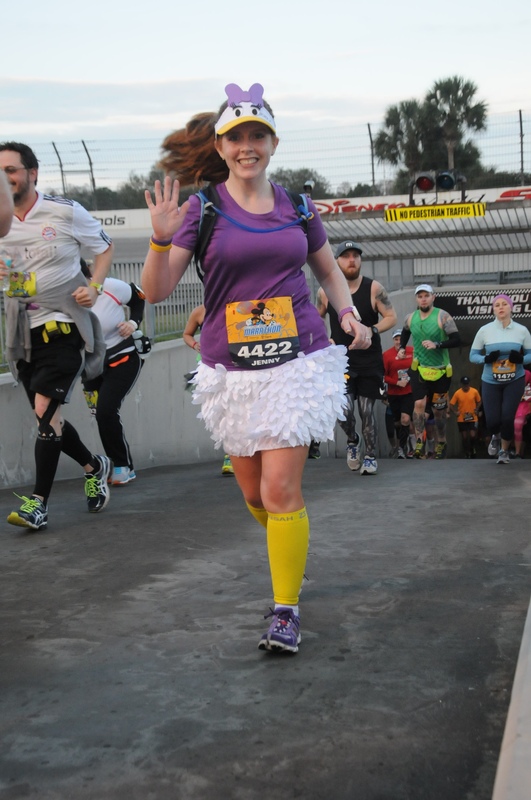 Disney is such a great running expereince.